In this paper, the three-dimensional rotating Boussinesq equations are considered. 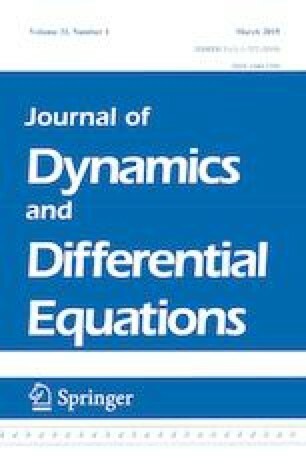 By striking new balances between the regularizing effects of the Laplacian dissipation and the dispersive effects of the Coriolis force, we obtain the global existence of mild solutions to Cauchy problem of the three-dimensional rotating Boussinesq equations. Particularly, the size of the norm of initial velocity can be arbitrarily large, provided that the speed of rotation is sufficiently high. The authors would like to convey their sincerest thanks to the anonymous reviewer for the insightful comments and suggestions. J. Sun’s work is partial supported by the National Natural Science Foundation of China (Grant No. 11571381), the Natural Science Foundation of Gansu Province for Young Scholars (Grant No. 18JR3RA102), NWNU-LKQN-17-11 and NWNU-LKQN-18-15. M. Yang’s work is partial supported by the National Natural Science Foundation of China (Grant No. 11801236), Postdoctoral Science Foundation of China (Grant No. 2018M632593), Natural Science Foundation of Jiangxi Province for Young Scholars (Grant No. 20181BAB211001), the Postdoctoral Science Foundation of Jiangxi Province (Grant No. 2017KY23) and Educational Commission Science Programm of Jiangxi Province (Grant No. GJJ170345).